Films can impact upon your life. There is no question in my mind about that. But whether it requires a ‘Perfect Storm’ - of real-life events combined with the viewing of a film, to make these impacts – that is something I have never quite worked out. So many of the films which have haunted my memory do not sit alone in there. They are inextricably joined with remarkable moments which occurred around the time of their viewing. So is it the film that impacts or the fact that it appears at exactly the right time? In 1984, I had just moved to London and was sleeping on the floor of a rather posh apartment just off Kensington High Street. The apartment was jointly-rented by a bunch of fellow-students and they were happy enough to give some more of us a foothold in London. It was a happy chaotic time, the first hint of a professional life, money in pocket and freedom beyond imagining. The movies were my main expenditure. I had to see everything on the weekend of its release and I had to see them in the West End. This remained the case for many years. Anyway, in 1984, on a particular Saturday afternoon, I was highly-buzzed about the potentially immense film I was to see that evening. Sergio Leone’s ‘Once Upon a Time in America’ had taken a little time to get to its British release but now it was here in its full four hour glory. I had my tickets, some reluctant flatmates to accompany me, and I couldn’t wait. That afternoon, I was contemplating buying a grey leather jacket for £200, which was a hell of a lot for a jacket back then. I was ‘new to money’, having just begun to earn in earnest. In the end, I bought it and wore it for the next ten years, pretty much without pause. So I guess I got some value for money. Until that moment, I had been remarkably good at dodging death. Nobody, really, had died in the twenty one years of my life. This man who had died was someone I knew very well. I stared at the note. In the next hour or two, I learned that I was really quite far from home. Had I been home, there would have been visitations, support, discussions, tears, reminiscences and community. Here there was only a creamy white telephone and a guilt that the bill-payer would not be me. After the call, there was a hole. What did one do, in a strange country, when someone you knew had died? The cinema was packed and expectant. The advantage of these first weekends was that it was a struggle to get tickets and so the people you saw the movie with were the people who really wanted to see the movie. And, along with them, I did the only thing I could do… I watched. For me, the film spoke highly eloquently of friendship and loss. In a real sense it burned itself into my soul and it has stayed there ever since. But was it the film or was it the moment I saw it in? I still don’t know. I see it now and it speaks differently to me. For a start, I see its flaws more clearly – there were no flaws in ’84. But, more than that, it now speaks more of ageing and the passing of time rather then of friendship. 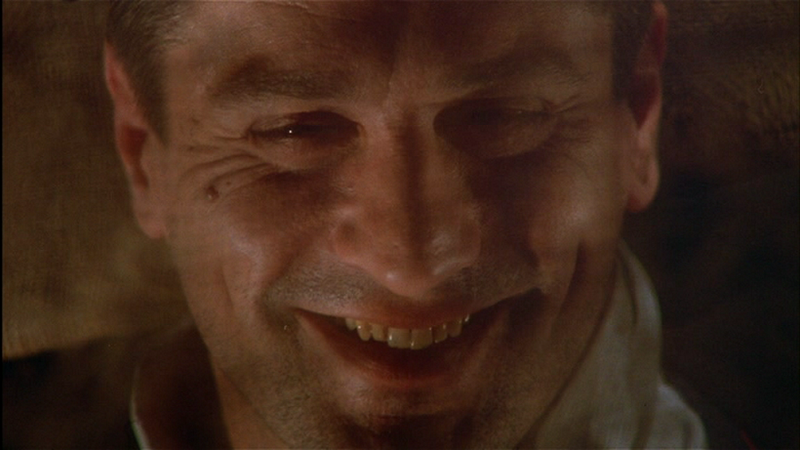 Two key scenes emphasis this theme; DeNiro, in the train station, caught in a mirror, aged. Elizabeth McGovern, porcelain in her theatrical makeup, unblemished by the passing of years and then, upon removal of the greasepaint, the truth revealed – that none of us ever really escape. So, once again, is it the ‘movie’ or the ‘moment’? … but that post-it note drove it a little deeper. I was talking about this only the other day, not about films so much but about books, reading a book at the right time for you, books like Catcher in the Rye that seem to go off as we age. 1984 was a good year for films if you check the Wikipedia listing for that year. I suppose you should be grateful that Caravan of Courage: An Ewok Adventure wasn’t showing. The film of the year for me was John Hurt in 1984. It was one of those books that I so wanted to see adapted for the big screen and them not screw it up and they managed it; John Hurt was, as he always is no matter how crappy the film, outstanding. It also had a tremendous effect on me. I wasn’t simply entertained. While Carrie’s away in the States I’ve been amusing myself with films I’d saved up since her last visit, things that she would watch but are more to my tastes, and I have not been that impressed. I’m finding these days that I’m looking for a lot more to a film than explosions. These are films that I want to like and I probably would have if I was twenty-five. Even then though I thought The Terminator was a great film I think I still preferred Broadway Danny Rose. It my experience, it's the synergy of both moment and art that raises the memory up. I doubt you would have responded so deeply to the movie (or an art gallery expedition at the same time) had your soul not been torn open by grief, loss, and other emotions. The synergy of moment and mood is what makes us open to receiving art beyond just being entertained. I can witness to the truth of that from many moments during the year and a half I was live-in caretaker for my parents until they died. And indelible moments from the funerals that got deep into my memory, because they emotion was there to drive them. When we look at art without much synergy of emotion, it often can be mere entertainment. It's when we engage with all of our feelings that art is activated, and becomes memorable. I could talk about memories I have of first reading certain poems, and of first writing certain others. What do we remember from films, after we've had a little hard life experience? We remember things beyond the surface. We remember things that director Michael Mann calls "the harmonics of human experience," those resonances that make us all human, and that make fictional characters seem real. My favorite films have always been ones with psychological depth, not with a lot of action-adventure explosions. I find actions movies to be a lot of fun; but the reason "Terminator" was so memorable was because it made me think about the future, and the possibility of changing one's fate via choice. The most spiritually mature film I've seen in years was "The Fountain." It has scenes of violence, but they lead to scenes of transcendence. Probably my all-time favorite film is Ron Fricke's "Baraka," an astounding, non-verbal film that takes one through an entire world of experience of spirituality, degradation, and redemption, ending with some of the most sublime time-lapse footage I've ever seen. I was transported; I still am, every time I see the film. Ken,I loved this piece.Have you thought of the way we receive a play or a film as part of an audience.Being in the company of one audience can made us warm to a film or a play but some audiences,especially noisey or in attentive fellow attenders can ruin a moment of emotion.When watching a film or DVD at home with family interuptions can make what should be a great film look flat and ordinary.